Jemba Against Domestic Violence is a 501 c 3 organization that helps domestic violence victims in South Los Angeles in times of need. Since 2007 Jemba's Toy Drive has collected and distributed thousands of toys for domestic violence victims living in shelters. J.A.D.V. has partnered with organizations like Project Peacemakers Inc., Peace and Joy and The Jenesse Center to bring awareness to the cause. As a college student and global citizen Jemba has learned from personal challenges that circumstances do not define who he is or what he can accomplish. Jemba has learned through his philanthropic efforts how to make a difference no matter how young, no matter how poor. J.A.D.V. wouldn't exist without the support of Nederlander Group, Legends Barbershop and Goorin Bros Hat Shop, Wagon Wheels Preschool, The Walther School. For more details please email oston@jemba.org or email coordinator: colette@jemba.org With your help we can spread a little joy to these families during the holiday season! Jemba's 2014 Annual Toy and Gift drive supported by Legends Barbershop ! 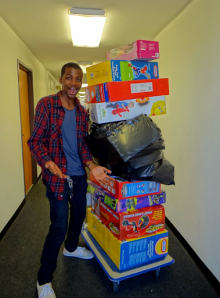 Jemba's 2014 Annual Toy & Gift drive goes global!